Thank you for helping our Walk-a-thon be a huge success!! 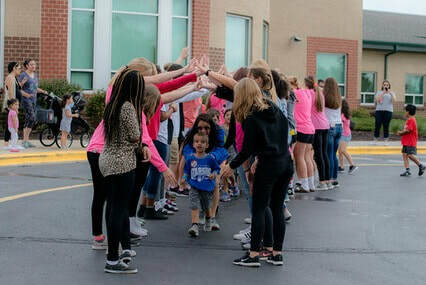 Starside staff, students and families rocked the Walk-a-thon! Students brought in $7,711 and with our corporate donations, we raised a total of $19,636!! Merck Animal Health Harps Food StoresGreat Southern Bank Plumbing by Fisher Chris Cakes Custom Foods, Inc.Goodcents Deli Fresh Subs Mekea Bartlett Photography Huhtamaki North America Geoff Harvey Trucking, LLC Harvey Brothers Trucking & Wrecking Co Inc Desoto Family Dentistry Jarvy's Shave Ice Tricentury Bank Great American Bank BB Hauling, LLC Kjspizzeria Sprouts Farmers Market D&S Engraving Cedar Creek Pharmacy Therapeutiq Engineered Air EngA John's Auto Repair Mermis Drywall Premier Aesthetics by Marie Delcambre Ridgeview Eye Care Via One Hope by Amee Henning SD Home Team McPherson The Layne Project Shawnee Mission Health Miss Maria's Dance Cheer Gymnastics Beautycounter by Jessica Fette Brandmeyer Off to Anyland Travel by Marci Kris Johnson - Keller Williams Realty Group My Child Advocate, P.A. Rodan + Fields by Julie Johnson Hudson Ridgeview Chiropractic Insulation specialties contractors, inc.
Click below for flyer in Spanish. Click below for flyer in English. We appreciate your support. Donate online below! You may donate online below through PayPal or send donations into school.